Defense Secretary Chuck Hagel and Gen. Martin Dempsey have signed off on a plan to strike ISIS in Syria, but it has not yet been approved by President Obama. The plan, put together by the U.S. Central Command, "includes targeted actions against [ISIS] safe havens in Syria—including its command and control, logistics capabilities, and infrastructure," Hagel told members of the House Armed Services Committee on Thursday. CENTCOM officials briefed Obama Wednesday on the plan, but the president didn't sign off on it, Hagel said. He added that the president wouldn't authorize every strike in Syria, but he does have to say that U.S. strikes can begin. The Defense secretary didn't say when strikes against ISIS in Syria could begin, or what specific locations would be targeted. A map released last week by the Institute for the Study of War, a Washington-based think tank that focuses on Middle Eastern policy, shows ISIS strongholds in eastern and northern Syria, near the border with Turkey. The president announced last week that the United States would target ISIS militants in Syria and continue airstrikes in Iraq, where it has already launched more than 170 airstrikes against the terrorist organization since early August. Strikes in Syria, which have yet to take place, present the U.S. military with a greater challenge. The United States has limited information on what is happening on the ground in Syria and it has to balance wanting to defeat ISIS without inadvertently helping Bashar al-Assad's government and military. The Syrian government said U.S. strikes will be seen as an act of aggression. Committee Chairman Buck McKeon said that while he supports the airstrikes, he doesn't believe it is sufficient for defeating the Islamic State in Iraq and Syria. "I do not believe the minimalist, counterinsurgency strategy is sufficient to achieve his objective," the California Republican said, adding: "We can not succeed from the safety of some headquarters building." McKeon, like some of his Republican colleagues in both chambers, has floated the idea of embedding U.S. special-operations forces with Iraqi forces or Sunni tribes. Hagel, however, repeated on Thursday a line often said by Obama: "American forces will not have a combat mission on the ground." Lawmakers have questioned administration officials on whether or not U.S. forces will be sent into combat, after Dempsey told senators during a hearing Tuesday that he would recommend itif he thought it was necessary. But the strikes in Syria are only part of a larger U.S. strategy, which is expected to extend beyond Obama's term. Administration officials have spent the week speaking with lawmakers during a handful of committee hearings and briefings about the U.S. plan to train and arm Syrian opposition fighters. 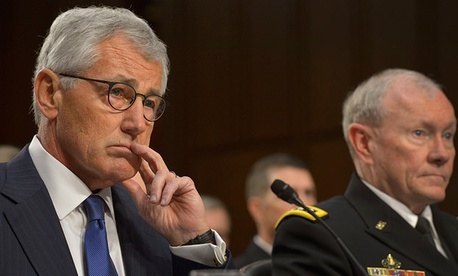 Hagel's appearance before the committee comes two days after he met with its Senate counterpart, and a day after House members approved the administration's request to arm and train the moderate Syrian opposition. The Senate is expected to vote Thursday on approving the program, which the Pentagon estimates will be able to train 5,000 moderate Syrian opposition fighters during the first year.